Music, motorcycles and Maniacs. Smoke outs, burnouts and call outs. Hot rods, hemis and Harleys. Bow ties, blue ovals and bracket bombers. 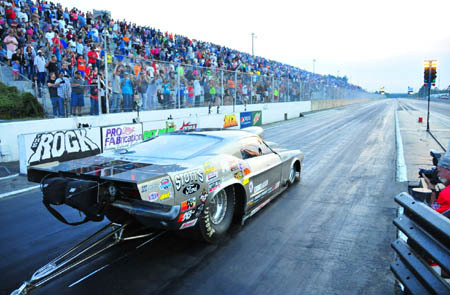 If it rolls - or even crawls and climbs, it'll race this season at Rockingham Dragway where on Tuesday, owner Steve Earwood released a 2016 schedule that starts in February and runs well into December. "We try not to be too predictable," said the man who has taken The Rock from a track that once ran only two races a year to one that next season will host 48 different events plus Roy Hill's Drag Racing School and private test sessions for touring pros competing on the NHRA, IHRA, AMRA and PDRA tours. 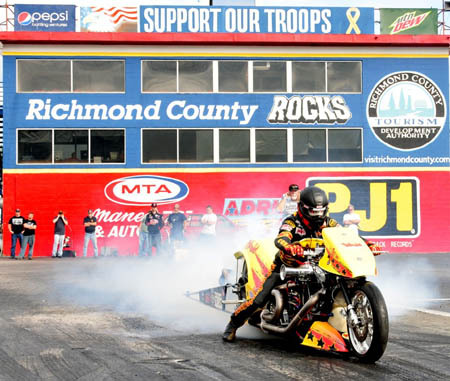 Earwood is especially excited about the third annual PDRA Spring Nationals, April 7-9, that will feature the world's quickest eighth mile Pro Modifieds, Top Dragsters and Top Sportsman cars and about a couple of events that feature people power instead of horsepower. "Last year, one of the big success stories was the Rugged Maniac series," Earwood said "It has nothing to do with cars, trucks or motorcycles. It's a bunch of athletic-types running through an obstacle course and then sharing a beverage or two at the finish line. "It was such a hit last season that we've added a second race next year," he said. "We'll have one in May and then we'll come back and do it again in October. Who would've thought people would respond to a race without wheels? It's just a fun event. Not something you'd want to do every week, but it's a nice break." Not that there won't be a full complement of traditional events at the track including the Dieffenbach Super Store Super Chevy Show presented by the Richmond County Tourism Authority, the NHRA Lucas Oil Series, the AMRA's Jim McClure Nitro Bike Nationals, the Roush Yates Sportsman Wars series and the Phantasm Motorsports Street Wars series featuring the KMS Drift series. The Phantasm series has quietly become one of the most popular for Sandhills area racers which is reflected in the fact that it will expand in 2016 to six events including a two-day finale Nov. 12-13. Other returning Rockingham staples include the third annual Jr. Dragster Southeast Nationals (March 19-20), the second Spring Bracket Nationals (April 22-24)the 18th annual Big John Memorial Weekend Bracket Nationals, the Inaugural Top ET Challenge, Tony Saraceni's Carolina Powerfest 4, Mopars at the Rock and the Hoosier Carolina Coalition Series.